Bonded Seals are also known as Dowty Seals or Dowty Bonded Washers. 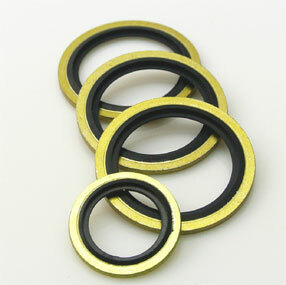 They are high pressure seals used in the Mechanical, Hydraulic and Pneumatic sectors. Bonded Seals were originally designed to replace copper type washers used in high-pressure systems. They consist of a metal washer and an elastomeric ring bonded inside the diameter. The metal washer prevents over-compression and limits deformation of the elastomeric ring. The sealing lip provides a leak-proof seal against pressurised fluids. Bonded seals are for sealing hydraulic fittings, pipe joints or under the head of bolts.